Republican Presidential candidate Donald Trump made a startling allegation today that Democratic Presidential nominee Hillary Clinton, is a zombie. Ever ready to play it’s critical role in U.S. democracy, the media responded by repeating Trump’s claim and along with their pundits, questioned Hillary Clinton surrogates if she was in fact a zombie or would agree to an examination that would determine if she was or wasn’t a zombie. The following exchange that occurred on MSNBC today between Andrea Mitchell and Hillary surrogate Howard Dean was representative of the media uproar. ANDREA MITCHELL: Mr. Dean, Donald Trump claims that Hillary is a zombie. She has denied that. Can you offer any proof that she is not a zombie? HOWARD DEAN: Come on, this is crazy! Why would you just accept and repeat any ridiculous charge that someone as desperate and unstable as Donald Trump has made against the candidate beating him? ANDREA MITCHELL: As journalists, we try to be fair and give both sides a fair hearing. Is it correct then that Secretary Clinton is unable to definitively prove that she is not a zombie? HOWARD DEAN: Andrea, it’s not being “fair” to repeat unfounded rumors and conspiracies, that’s just spreading propaganda, it’s not news! Think about the word itself, “news”. It’s supposed to be a synonym for “truth” so it’s not being slanted to ignore or call out dishonest slurs, it’s having what they used to call “journalistic integrity”. ANDREA MITCHELL: So you’re saying there may be a conspiracy here? That Hillary isn’t being transparent on the zombie issue for some secretive reason? HOWARD DEAN: When did I say that?! Okay, I get it, the race has been looking one sided since the conventions, Trump looks like a sure loser so the tension in the race has deflated. People aren’t as nervous about the election because the outcome seems more inevitable now and your ratings are down. You’re owned by a corporation that only cares about getting high ratings so it can make higher profits on advertising. So you need to violate the ethics of your profession and actively meddle in the presidential race to try and make it closer than it is so that more people will tune in more frequently to follow every manufactured twist and turn that’s breathlessly “Breaking News”ed on your network. Isn’t that what should be the real “news” for the American People, that our corporatized media is corrupt and meddles in our democracy for profit? ANDREA MITCHELL: You bring up a powerful point. So let me ask, have you ever seen Hillary Clinton eating a brain? HOWARD DEAN: No but I’ve seen media corporations doing it! Look at you and others on this network and other networks, desperate to do the bidding of your corporate bosses who are far from being the “liberal media”. You’re ready and willing to promote whatever memes the corporation wants you to push out of fear that you’ll lose your jobs if you refuse. ANDREA MITCHELL: I must say at this point that I don’t think that’s a fair criticism. I have the freedom as a journalist to express whatever I choose to say and if it happens to be that Exxon/Mobil is working hard to reduce carbon in our atmosphere or that single pack Viagra allows you the freedom to respond when that special moment arises, that’s my right as a journalist. Buy Doritos. HOWARD DEAN: And add to that, how can there only be four or five stories out of all of what’s happening in the entire country and world? Hour after hour, you cover the same several stories over and over, regurgitating the same words and video like a deranged media parrot. How about providing a more comprehensive view of the world around us so we can gain more insight and knowledge about what’s really happening out there? ANDREA MITCHELL: There’s no reason why we can’t so let’s start here, do you think it would make a difference to core Hillary supporters if they learned that she was in fact a zombie? HOWARD DEAN: I don’t think so, your viewers are still watching you, aren’t they? ANDREA MITCHELL: Mr. Dean, I’m sorry but that crossed the line. I’d ask that we stay on the bigger issue and have the decency to avoid personal attacks. 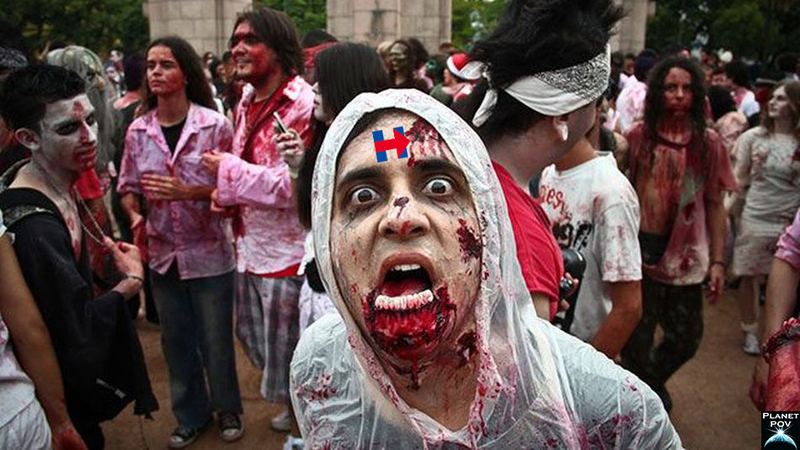 Now, is Hillary Clinton’s lack of condemnation of zombies in any past speech, reflective of her support for zombieism? Howard Dean then repeated his famous scream before bursting through the backdrop on the set and smashing through the wall, leaving his cartoon-like outline. Reached for comment, Andrea Mitchell expressed complete confusion at Howard Dean’s behavior and just wanted to note that she is available for hire for birthday parties, bar mitzvahs and zombie apocalypses. AdLib, are you as amazed as I am that Andrea Mitchell isn’t able to detect a real zombie when she sees one? I mean, when she goes home from her job as a corporate spokesmodel — errr — news reporter and sees that her husband Alan Greenspan and his BFF Henry Kissinger are in the library of the mansion, drinking very, very, very red wine — surely she knows exactly what they look like. Kes, maybe there’s a reason for that? Like…Andrea Mitchell is…a zombie! Just look at her hubby Greenspan and Kissinger, talk about The Walking Dead! And I believe that wine is just her type, Type O negative? I think you’re on to something here, AdLib. All three of them are oh so negative. He poses a dissensus. Is she a zombie or a bigot? A zombgot or a bigie? Does he know the difference between a bigot, a spigot and a gigot? “ANDREA MITCHELL: You bring up a powerful point. So let me ask, have you ever seen Hillary Clinton eating a brain? Brilliant Ad! And it is the absolute truth. FOX does it 24/7. They have a real brainlust! Thanks KT! And considering what Ailes had going on at Fox, “brainlust” is a perfect tag on them! AAAH!!! It’s true!!! Did she bite Jill Stein??? AAAHH!!! LOL! I think she did, and Gary Johnson is next! I think Gary Johnson is safe, he tastes too bland for anyone to bite him.